This is a torch height controller electronics for plasma cutters. Connect the plasma Voltage to the controller and set the control Voltage and the controller will produce the tourch up/down and on signals to control the machine s Z-axis keeping a constant torch height making a high quality cutting, saving you tips and not at last can cut bent, not straight sheet materials too. Download the product manual here! 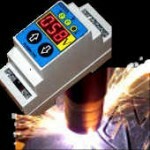 This is a torch height controller electronics for plasma cutters. This THC controller controls the Z axis drive directly, the Z axis drive s step and direction signals has to be wired directly to the THC controller. Connect the plasma Voltage to the controller and set the control Voltage and the controller will produce the step/dir signals for the Z-axis motor controller to keep the torch height constant.